Are you searching for a solution to have a comment and feedback section on your web page? Well, you are at the right place then! But does a comment on a post or product make an impact? Indeed! Because whenever a user posts comment on your website, it is considered as a genuine review by other users. Hence, it becomes very essential to have a commenting section that is not just fully functional but also have authentic opinions on the site. 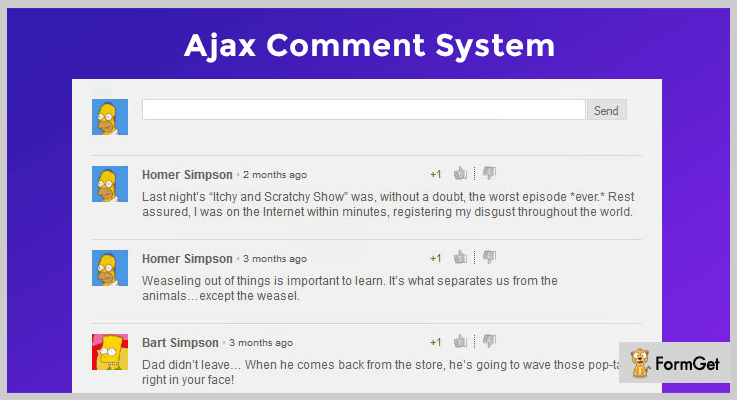 In this blog, you are going to discover numerous prominent features of AJAX based commenting scripts. For example, users can post comments via social media login, and even reply, like & vote for the published comments. Every user will seek admin’s approval to post their comments before they get published. This helps a lot to keep the comment section absolutely free from foul and inappropriate content. Further, comments posting is done in bulk and that too from unknown sources. Hence, the use of Captcha will give the best protection against spams & bots for your website. Let us discuss these scripts in detail now. Take a little time to read these popular blogs as well. 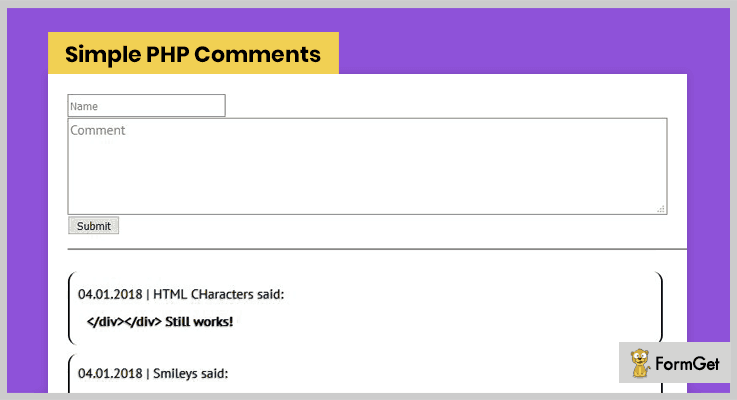 You can have an effective commenting system in your website by using this PHP script. You can include this script in your website with a single line of code and have an AJAX based commenting system. Admin can have a sorted list of comments (newest/oldest/best) in the dashboard and various other important stats like pending, latest comments etc. Further, this script allows you to provide a social media login option to the users to post their comments. Moreover, it allows comment posting by admin, member, and guest on the website. The script is highly customizable as you can either use 5 provided themes like dark, blog, boxed etc. or create your own theme. In addition to this, it comes with font awesome icons. There is comment approval system which facilitates the admin to post the comments only after his approval. With comment reporting system, admin can have the entire record about comment marked as a report like when was it posted, who reported the comment etc. Further, he can edit the comment or simply delete it. Built in with avatar uploader, users can easily upload an image with their profile so that they can be visually identified while commenting. This ready-to-use script is available at $20 with 6 months support. In future, if you want to extend the support for 12 months, it will cost you only $5.63. 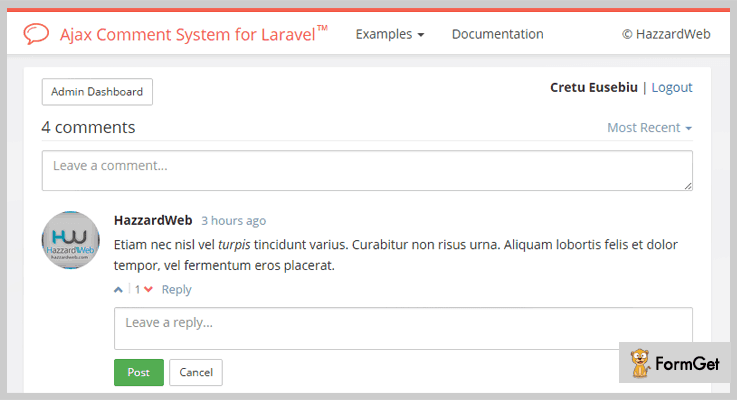 The best way to manage numerous comments from the users on your website is via integrating this PHP script. Its word censoring functionality helps the admin to take relevant action on the respective comment from the user. Once a user login, he can post comments in real time, write replies to the published comments & even vote for them and preview their reply before posting it. Furthermore, users can also embed media in their comments from Youtube, Facebook, Twitter etc. The inbuilt Akismet (which is a spam filtering service) detects & filters out spams from the comments. It supports BBcodes & Markdown markup languages which are essential tools for online discussion forums to add text formatting like headers, bulleted list etc. The URLs mentioned in the comments automatically gets converted into clickable links. Similarly, image URLs will be converted into the actual image. With Captcha & throttle login, you can get best protection against bots for your website. Start using this comment PHP script with a very affordable rate of $14 and get a support of 6-months. You can anytime extend this support to 12 months at $4.50 only. 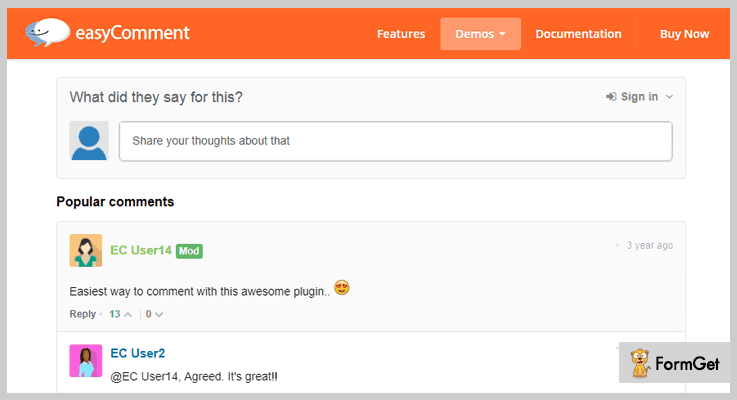 Review Comments is a commenting script which is developed from the CodeIgniter framework. This amazing commenting script can be included on your website with one click installation. You can use it for multiple sites of any kind like WordPress, custom PHP framework etc. where users can post their comment via login/registering in your website or by signing in from their Facebook or Gmail account. Under the dashboard overview, you can have 3 panels – total admin users, total comment users & total comments. Besides commenting, users can also provide the rating, & give likes/dislikes on the comments. It provides a JS code sample, that can be modified as per requirement to enable the comment section in more than one website. Hence, you do not have to write a code from scratch. You can update the form fields that a user has to fill while posting his comment. For example, add fields like phone, picture & rating besides name, email & password. Get this PHP commenting script for your website at $15 only where you will also get a 6 months support. In order to extend this support for 1 year, you just need to pay an additional amount of $3.75. This PHP script for commenting system allows you to take unlimited comments from the users (both logged and guest users) on your website. Further, it provides you with 2 different skins to have an attractive layout of your web page having the comments section. When a user posts his comment, the AJAX pagination allows updating your web page content without suffering page refreshing. Admin has various authority like limiting the maximum number of characters for a comment, setting moderation of comments and a lot more. With multi-language support, you can facilitate the users to post their comments in languages other than English. Get this script at a very reasonable rate of $14 and 6 months support. You can extend this support to 12 months at $3.38 only. 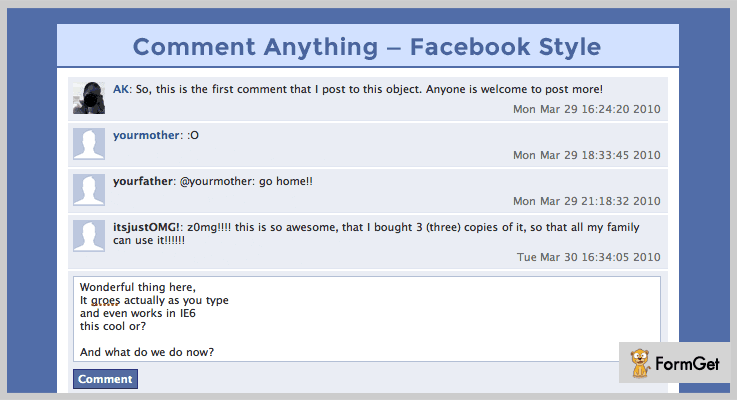 You can add a Facebook like commenting system on any webpage of your site. This script can be merged into the website in a matter of a few minutes and you are good to go. It is an absolutely error-free script and doesn’t affect the loading speed of your website. You get complete control over every single element as the customization feature is complete. Further, it provides an attractive view and layout of the web page which is 100% customizable. The script is supported by gravatar that provides unique avatars. These avatars are globally used by users while posting their comments. It allows blurring the emails of the commenters so that spam does not target those email address in future. Also, you can disable the name and email addresses inputs from the user & post the comments directly without revealing their identity. The included CSS file allows automatic textarea resizing helps to manage your web page space more efficiently. Purchase this script with a one-time payable amount of $9 only. Just like its name, this comment PHP script is absolutely simple & easy to handle, and lets you have a commenting section of your webpage. With basic PHP & CSS knowledge and a PHP ready web server, you can allow users to post comments and feedback on your website anonymously. You can easily configure every aspect of this script. For example, you can alter the default storage and display of the comments. The code is very lightweight on your system as it weighs approx 5 KB only. By default, the comments are stored in a text file so that you do not have to deal with the database at all. With this script, you can have a standalone comment page that can act as a comment forum or on a webpage that integrates a comment section. Get this comment and feedback PHP script with a one-time payment option at an unbelievable low price of $5 only. I hope you have gone through all of these scripts in detail and have decided which one to choose. Each one of them is tried and tested on a personal level. Hence, you can directly start using the best-suited PHP script for your website right away. Lastly, if you want to have a commenting space in your webpage, which is as good as ours, but does not have a helping hand from professional developers, you should definitely go for such PHP scripts. In case, you find any query or have a suggestion, drop a comment in the below section.